EVGA has written to HEXUS to inform us that its new improved X299 Micro ATX 2 motherboard is available to purchase. In its introduction to this new product, EVGA claims that it is probably "the best mATX overclocking board for the X299 chipset". 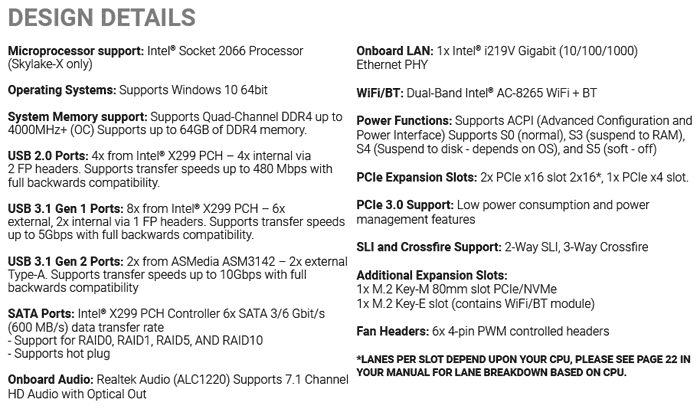 Key features include; the 14 phase power design, a thick VRM heatsink/fan, two 8 pin EPS power connectors, an additional 6 pin PCIe power connector, external BCLK, M.2 NVMe, Optane support, plus an integrated Intel Dual-Band WIFI/BT and an Intel i219V Gigabit NIC. 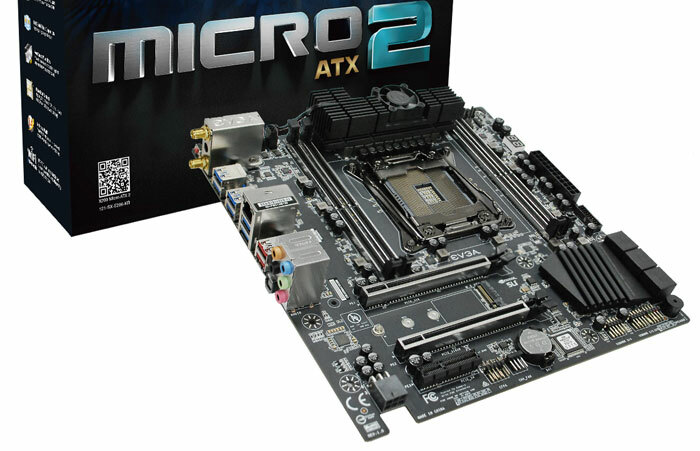 Overall, it is designed to appeal to enthusiasts designing for maximum power in a small form factor. The new EVGA X299 Micro ATX 2 motherboard features the aforementioned 14 phase digital VRM that is capable of overclocking Intel's most powerful Core-X Series i9 processors. The additional 8-pin CPU connector ensures you have enough power for stability at the highest clocks. If you look at the board design, above the CPU socket in the top picture the specially designed VRM heatsink with active cooling is easy to pick out. 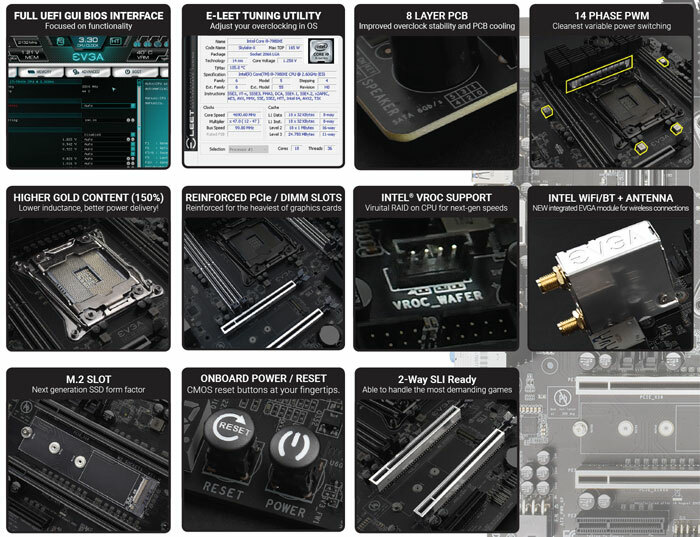 Another highlight of the X299 Micro ATX 2 motherboard is the new GUI BIOS. EVGA says this BIOS has features that are new to EVGA and new for the industry. For example the EVGA OC Robot can overclock your system automatically. If you want to be more hands-on there are a multitude of OC settings to tweak. On the topic of the BIOS, EVGA has also introduced a USB key that can flash a BIOS update to this motherboard. The board doesn't even need a CPU installed for this BIOS flash method to operate. Other niceties worth mentioning before we hit the specs are that the EVGA X299 Micro ATX 2 features an integrated Wi-Fi module that contains the Intel AC8265 Wi-Fi/BT. EVGA has included dual wireless antennas. The board supports PCIe NVMe storage (thermal pad supplied), Intel Optane memory, Intel VROK, EVGA E-LEET turning, and is equipped with reinforced PCIe and DIMM slots. The EVGA X299 Micro ATX 2 motherboard appears to be ready to order both in the US and Europe, priced at $299 (without sales tax added) and €289 inc VAT. 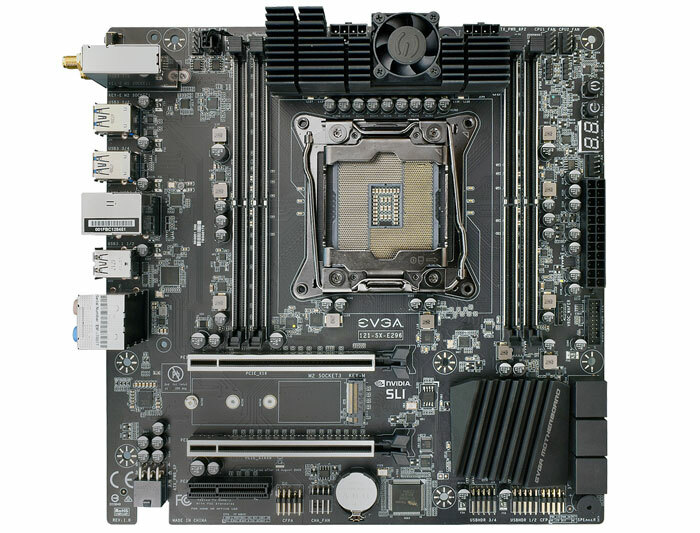 The last X299 motherboard reviewed here on HEXUS was the E-ATX sized EVGA X299 FTW K, back in March this year. I found that site very useful.